Yet according to The National Invasive Species Council, invasive plants are far from our friends. They are “an alien species whose introduction does or is likely to cause economic or environmental harm or harm to human health.” But many prominent scientists, biologists and conservationists disagree. This figure attests to the gargantuan use of pesticides and herbicides on invasive plants in the US alone, never mind Canada and the rest of the world. The science of invasion biology is now deeply entwined with the chemical industry. Herbalist Timothy Lee Scott , author of Invasive Plant Medicine: The Ecological Benefits and Healing Abilities of Invasives, agrees with the views put forward by Pearce. He believes that the view of invasive plants as disruptive “is no longer supported by a scientific, ecological understanding of plant dynamics within complex eco-systems”. Scott’s book compiles a wide variety of studies demonstrating that many invasive plants are actually cleaning up the mess we’ve left behind, healing damaged landscapes, breaking down and eliminating toxins, renewing and restoring degraded soil and waterways. Boyce Thorne Miller the Science and Policy Coordinator of the Northwest Atlantic Marine Alliance, argues that much of the “scientific” evidence that is typically used to describe ecological harm can be equally interpreted to indicate ecological benefits. Her presentation at the 32nd National Pesticide Forum in April 2014 at Portland State University, presented evidence that many “invaders” like Cordgrass have been shown to be important for revitalizing damaged ecosystems, repairing depleted soils, cleaning up toxics, and are essential for creating and maintaining biological diversity. With this in mind, it could be suggested that invasive plants are not evil marauders intent on colonizing and dominating local ecosystems. Indeed they can be prolific because they are a response to human’s relentless anthropogenic behavior such as urbanization. As we clearcut the forest, drain wetlands and upturn soils, we destroy biodiversity – so this results in Mother Nature, sending more and more ‘weeds’ to repair the damage we’ve done. Are Invasives Seeking to Heal Us? Scott’s book proposes another startling and radical idea – that nature is not only seeking to heal her landscapes – but also the life forms that inhabit her. Scott suggests that in the wake of environmental devastation and diminishing plant life, nature quickly responds by providing highly nourishing and healing foods to the animals, which depend on her sustenance. And that includes us. He writes, “The deteriorating health of our forests is analogous to the current weakening of the human immune system…People, like the Earth itself, are overburdened with toxic and infectious burdens, and all ecosystems cope with poisoned and traumatized influences”. So Scott sees it as no coincidence that nature provides wildlife and humans with prolific nutrient foods packed with deeply healing medicinal components. Scott also cites research conducted by herbalist Stephen Buhner who believes there may be a “medicinally significant connection between pandemic plants and diseases”. While researching plant candidates for treating Lyme Disease, Buhner discovered that Knotweed which is currently the number one target of conservation groups like the Coastal Invasive Committee, had spread throughout North America in nearly the same trajectory and at the same rate as Lyme Disease. Buhner’s research suggests that Knotweed’s potent properties as an antimicrobial makes it a useful treatment for emerging diseases such as Lyme, West Nile Encephalitis, SARS, Hepatitis C and HIV. So who truly knows best? Humans or Nature? Are our conservationist efforts to restore local eco-systems to their original ‘natural’ state doing more harm than good? The jury may be out on whether or not in the long run we are hindering nature’s remedial processes. In the meantime as we apply millions of dollars worth of toxic chemicals to our landscapes each year we had better ponder the laws of unintended consequences. Are invasive plants truly destroying “pristine” natural environments? Here in Victoria removing invasive plants from Garry Oak groves is a huge conservation priority. It is estimated less than 5% of Garry Oak systems remain in the Pacific Northwest (to which the Garry Oak is unique). Today we are spending hundreds of thousands of dollars and hours of human resources to restore their ecosystems to a pre-colonized state. 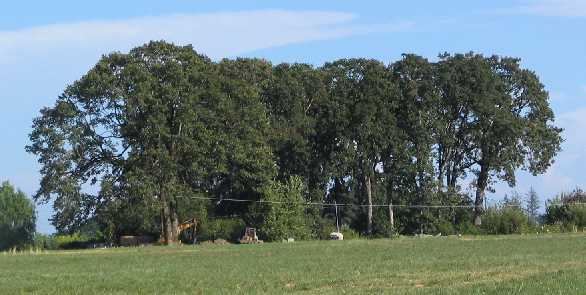 But as many First Nation leaders have pointed out, this idea of Garry Oaks groves as pristine “untouched” landscapes – just doesn’t hold water. History shows that at the turn of the century, when local first peoples asked their new “government officials” for permission to continue harvesting Camas bulbs in Garry Oak groves, they were denied. This starchy sweet bulb was a beloved and important food source in their diet, and they were regularly altering Garry Oak ecosystems through controlled fires and other food cultivation techniques. We should not allow Garry Oak Groves and their beauty to vanish, but maybe by allowing invasive plants to thrive, the natural systems anchored by biodiversity will optimize the survival of the Garry Oak. It may appear that plants like garlic mustard are the bully of the plant world – seeking to colonize and dominate – but maybe it just looks that way to us within the short-term view of 40 or 50 years? Timothy Scott in his book Invasive Plant Medicine: The Ecological Benefits and Healing Abilities of Invasives makes the point that our fear that invasives will create monstrous monocultures just isn’t in line with nature’s tendency towards evolving complexity and creating biodiversity. Scott reminds us that all plants serve ecological functions for their environment. There is growing evidence suggesting that once invasive plants fulfill their function of repairing damaged soils and waterways they will naturally die back into a safe balance within the ecosystem. Bu the question remains – are our attempts at invasive species removal especially by chemical means working against the remedial processes of nature? Are we letting our ‘feelings’ get in the way of even contemplating such an idea? Some people might see invasive plants as a metaphor for western colonization – just as we colonized the First Peoples, the plants we brought with us – are destroying the land. Some people might believe that protecting indigenous species is an important way of restoring some of the damage colonization has done. Should we all of a sudden let nature “go wild”? We should fully acknowledge the importance of restoring traditional foods and medicines like Camas. In fact we are dealing with new “invaders” not found in pre-colonization landscapes. But by merging indigenous ways of plant cultivation with non-toxic methods of invasive plant control as suggested in Tao Orion’s book Beyond The War on Invasive Species: A Permaculture Approach to Ecosystem Restoration, we might find new, less toxic ways of dealing with so-called invasives. But the political dynamic remains and where I live in Victoria, I am curious what the Lekwungen people think about the recent use of Round-up and Garlon in the Garry Oak Groves of Uplands Park which is in and by the fields containing Camas and within their traditional territory? I’d like to know whether they’d like to see some of the budget currently spent in federal, provincial and municipal budgets on herbicides – redirected towards restoring indigenous methods of plant cultivation and control? I acknowledge too, there are dangerous plants we want to keep at bay. Plants I’m not too fond of myself, like Poisonous Hemlock or The Giant Hogweed or English Ivy. But as we go about our processes of removal I think it’s also important to ask whether these plants are fulfilling necessary ecological functions of which we are currently unaware? We need to find new ways of responsibly dealing with invasive plants in a way that puts the health of the ecosystem as it’s first priority – not whether it has been successfully denuded of invasives or represents some pristine prior state. How do we strike a balance when it comes to saving beloved wildflowers, restoring indigenous food systems or removing toxic or poisonous plants that threaten our safety? Will increasing the applications of Round-up within endangered ecosystems really the best we can do? By eliminating invasive plants in our environments with toxic chemicals which are now proven to be harmful to life – could we be increasing stressors on our already struggling ecological systems? This all leaves us wondering, just how big of a role does the chemical industry play in shaping our idea that invasive plants must be eradicated? Is the toxic chemical war we are waging on invasive plants doing more harm than good? Noxious Enemy or Remedial Friend? Environmental journalist Fred Pearce was once an invasive fighting conservationist but at some point along his journey he changed his mind – and then wrote a book. In his book The New Wild: Why Invasive Species Will Be Nature’s Salvation, Pearce concluded that the current view of invasives as aggressive interlopers spoiling pristine, natural ecosystems is based on “outdated intellectual sources”. Quercus garryana, the Garry oak, Oregon white oak or Oregon oak, is a tree species with a range stretching from southern California to southwestern British Columbia. Garry oak is the only native oak species in British Columbia, Washington, and northern Oregon. In these areas, Garry oak woodlands are seral, or early-successional – they depend on disturbance to avoid being overtaken by Douglas-fir (Pseudotsuga menziesii). The disturbance allowing Garry oak to persist in an area that would otherwise succeed to coniferous forest was primarily fire. Natural wildfires are relatively common in the drier portions of the Pacific Northwest where Garry oak is found, but fire suppression has made such events much less common. In addition, early settlers' records, soil surveys, and tribal histories indicate that deliberate burning was widely practiced by the indigenous people of these areas. Fire perpetuated the grasslands that produced food sources such as camas, chocolate lily, bracken fern, and oak; and that provided grazing and easy hunting for deer and elk. Mature Garry oaks are fire-resistant, and so would not be severely harmed by grass fires of low intensity. Such fires prevented Douglas-fir and most other conifer seedlings from becoming established, allowing bunch grass prairie and Garry oak woodland to persist. Fire also kept oak woodlands on drier soils free of a shrub understory. Wetter oak woodlands historically had a substantial shrub understory, primarily snowberry. Garry oak woodlands in British Columbia and Washington are critical habitats for a number of species that are rare or extirpated in these areas. Cheryl Bryce, lands manager for the Songhees First Nation (Lekwungen) holding a traditional digging stick during a camas harvest at the University of Victoria, where she led the first community camas harvest in 150 years. Today ‘restored’ Garry Oak Parks are regarded with reverence. No trampling of precious flora must occur, trails must be kept on, and no wildflowers picked. Is this “restoration” reflective of a ‘natural state’? What if, as Fred Pearce suggests in his book The New Wild: Why Invasive Species Will Be Nature’s Salvation – there is no one singular “pristine state” to return to? Geological studies clearly show that our environment is in constant flux, ice ages come and go, weather changes, comets hit the Earth and cloud the Sun. Ecosystems are adapting, dying and being reborn all the time. There is no stasis in nature. Add to this the continuing impact of human occupation, and the fact that humans have been introducing alien foods and seeds to new lands for thousands of years, and you can see why its difficult to pin down any one time as epitomizing a true ‘original’ state. ...many “invaders” like Cordgrass have been shown to be important for revitalizing damaged ecosystems, repairing depleted soils, cleaning up toxics, and are essential for creating and maintaining biological diversity.